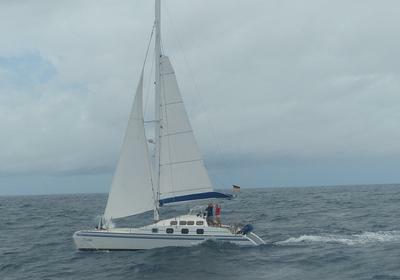 “Thetis” for sale, a unique 42 ft catamaran: Classical lines and atmosphere combined with high-tech features. 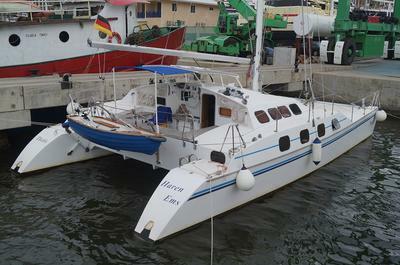 Thetis, a Tropic 12, was built by Samuel Boudon, boatyard Force la 3 in La Rochelle, France in 1990. Only one similar boat was built. She is unique. I bought her 1994 and had a few alterations made by a boatyard in Germany, which gave her her present outward appearance and added a well-spaced navigator's table in the saloon. Until 2005 Thetis was sailed in the North Sea, Baltic and Atlantic and into the Mediterranian Sea in 2006/7. For the winters she was taken up river Ems to her home town, Haren, where she spent all her winters under a tent on the dry on my property. Time enough for regular maintenance and modernization. Most of the sailing was done with a crew of two, myself together with my partner or a friend. Thetis can easily be handled by two persons only. In all those years Thetis had proved herself sturdy enough for serious blue water sailing and we proceeded with our plans to take her across the Atlantic. This decision led to quite a few further changes concerning her bluewater sailing capabilities. Her old aluminum mast was exchanged in 2015 for a 16m carbon fibre one, longer than before. but also much lighter. Most of the standing rigging, apart from the forestay, is now dyneema. Parts of the halyards and the sea fence have been exchanged for dyneema, too. All of this has improved Thetis' general sailing performance and also her speed in light winds. After a profound checkup and a lot of maintenance work (for example new seacocks throughout) in early 2016 we took Thetis' to the Canaries, the Cape Verdes and Barbados, where we arrived in Nov after a 14-day-crossing. On this long voyage Thetis has proved herself a willing, fast and safe boat. All the work including sail setting and trimming can be done from the cockpit by one person. We, the regular crew of two, arrived rested and relaxed and the boat had no failures at all. We also enjoyed the independence, which enough solar-generated power and a watermaker give you. Since November 2016 we have sailed her in the Caribbean. With more than 50,000 miles sailed Thetis is certainly a safe, seaworthy boat equipped with everything useful on long-term sailing. At the same time she is a slender, light and therefore fast boat. Thetis is ready for the next 50.000. The regular maintenance due after the Caribbean sailing season is done during the present haul-out. There are no repairs pending. As we are getting older our priorities are changing. Instead of an equilibrium of safety, speed and comfort the balance is bending more towards comfort and safety now. Thus we are looking for a larger, more comfortable boat and want to find a new owner for Thetis. Under water: GRP, above water: plywood/epoxy. All surfaces inside the boat are either solid wood or veneered marine grade plywood in maple. The hollow keels have single skin laminate to withstand grounding and are independent of the hull structures. The rudders are semi balanced with stocks of 2 inch diameter aluminum rods. The steering system is hydraulic (Robertson RPU 160 pump + Lecomble& Schmitt cylinders). Emergency steering access is available in each hull. Two independent autopilots are available. 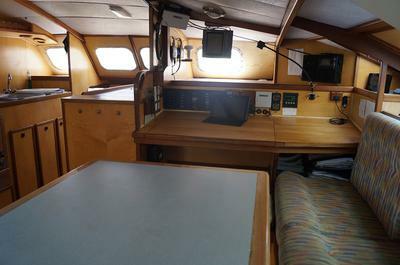 The saloon (hight 1,72 m) contains a six seat dining table with U- shaped settee, chest of drawers and full size chart table with electrical control panels, VHF/active AIS, Radar and radio. Plenty of storage room in compartments and shelves behind and under the settee. The galley on the port side of the saloon consists of a gas stove (3 burners), a gas oven/grill, double sink, fridge WAECO MODEL 54 (90 liters), ample space in various cupboards and drawers. A shower room is next to the entrance with space for wet clothes. The hulls (hight 1,90 m) each have a double bed above the engine-room with a Smartvent solar ventilator, plenty of storage room in a wardrobe, lockers with sliding door and shelves, a single bed and a heads compartment (toilet with a JABSCO manual pump, washbasin). The bow spaces (watertight) are accessible through hatches in the deck and contain a sewage tank and plenty of space. More storage room (bikes) can be found in the stern. The cockpit is partly protected by a hard roof (hight 1,85 m), built in 2016. A flexible awning and 2 sunproof awnings can be added (2016). The cockpit has U-shaped benches with teak grating. Access from the cockpit to the saloon is through a plexiglass door. The lower part of the door can be protected by a customized wooden hatchboard against water in very heavy weather., never used. In the middle of the cockpit is a flush mounted locker for gas bottles and diesel jerrycans. Thetis is equipped with a 16 m carbon fibre mast with a three point rigg. The rigging consists of 16 mm Dyneema shrouds and a 10 mm Dyform stainless steel forestay with a fitted Profurl C420 roller reefing system (2015). The main runs in FACNOR aluminum tracks with Facslide F 10 ball bearing cars. It is reefed by 3 in-boom reefing lines led back to the cockpit from the mast. Guard rails are 6 mm Dyneema supported by stainless steel stanchions, with stern gates. • Main engines 2 Yanmar 2GM20 (F), 18 hp each with Yanmar saildrive SD20 driving Gory two-blade 15 x 12 fold propellers. • Backup: 1 ALCO 15 x 9 L fixed propeller. The engines have run for approximately 5000 hours and have been serviced in accordance with the manufacturer's recommendations. • 100 liter holding tanks for both toilets. •4 x USB-sockets, 1 x 12V – car socket. •Anchor buoy with 15 m tripline. • Two large lockers in front of the mast hold mooring ropes, anchoring gear and fenders (4 cylindrical, 4 raindrop fenders). Stainless steel davits to carrry a dinghy of appropriate size. • Extensive range of spares. 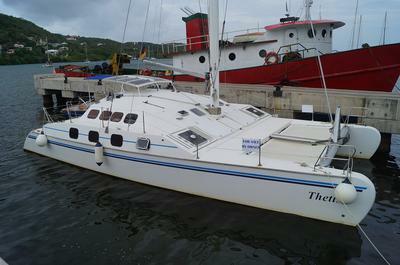 Thetis is currently on the hard in Clarke's Court Boatyard, Grenada in the Southern Caribbean. She will be re-launched in 10/2018. please send me an email adress, where I can send additional information.